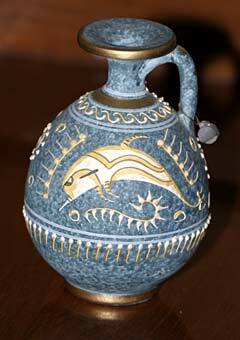 Early Greek artists frequently adopted dolphin motifs. One of the earliest and best-known ornamentations is the 3,500 year old dolphin fresco on the wall of the Queen's bathroom in the ancient palace of Knossos on the island of Crete. The animals depicted in the reproduction of this fresco are probably striped dolphins. Also seen are a variety of fishes and sea urchins. It is believed that the artist was well conscious that this was an entire ecosystem. This is Genevieve Johnson speaking to you from the Odyssey in Greece. Off the west coast of Crete, striped dolphins are our daily companions. 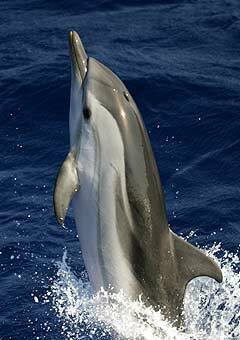 Of all the dolphin species in Greece, this strikingly marked animal is probably observed most often. Their presence and jovial antics beneath Odyssey's bowsprit remind us of a relationship between the ancient Greeks and these marine mammals that extends through thousands of years of history, culture and mythology. Poets, scientists, philosophers and artists from seafaring nations around the world referenced this remarkable group of animals for centuries, perhaps none more so than the Greeks who had a particularly strong affinity for dolphins. We see evidence of this association through the works of many classical Greek scholars, from the naturalists Aristotle and Theophrastus to the historians Plutarch and Herodotus. While researching in Greece striped dolphins are our daily companions. Their presence reminds us of a relationship between the ancient Greeks and these marine mammals that extends through thousands of years of history, culture and mythology. 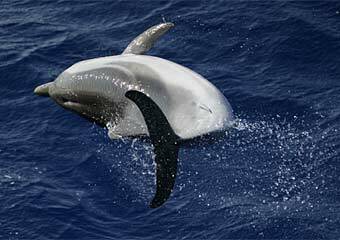 "The relationship between cetaceans and Greece is well known. What is much less known is that cetology - the science that studies dolphins and whales was born in Greece about 2,350 years ago. Aristotle was the first to observe cetaceans in their environment and to write down and take notes of his observations. He actually scientifically published his results. He not only took notes, and this is amazing, but he took notes about the methods he used. We have to say that Aristotle was the first to put together the basis of a very modern method used in modern cetology and also during this 'Voyage of the Odyssey' this method is used, it is called 'photo-identification'. We are taking pictures of dolphins and whales and we can recognize them due to their characteristics marks later when we resight them. So Aristotle didn't have a camera during that period, but what he did in collaboration with fisherman, when their was a dolphin captured and entangled in the nets but still alive, before releasing it they were creating an artificial notch on the dorsal fin of the dolphin. So in this way, dolphins that were resident in an area could be resighted for many years. It is amazing that in his book (Historia Animalium) Aristotle wrote that the common dolphin (we don't know if he was referring to the common dolphin (Delphinus delphi) or the bottlenose dolphin (Tursiops truncates) - can live for at least 25 or 30 years, or even more. This is amazing because even today it is difficult using our methods to estimate the duration of life for a species like the dolphin. Something else that is important is that Aristotle new that there are whales in Greece. He even described some of their behavior. He described the sperm whales, and he also made the taxonomical separation between the baleen whales and the toothed whales (like sperm whales) and we still use the scientific name he gave to the Mysticetes. He also knew that there were porpoises in the northern Aegean. Even today, most of the people in Greece and probably most other countries, they cannot distinguish between a dolphin and a porpoise, but Aristotle did and he wrote down these observations." Dolphins were part of Greek culture for thousands of years and are present in artworks wherever the Greeks had influence, from Rome to Mesopotamia. We don't know exactly what the significance of the dolphin was for the Greeks. However, according to Dr. Alexandros Frantzis - "the image of dolphins then, like nowadays probably had some relaxing effect toward humans and were probably a symbol of the harmony and the health of the marine environment." Early Greek artists, apparently inspired by the dolphins' intelligence and seeming friendliness towards humans, increasingly adopted dolphin motifs on frescoes, mosaic floors, ancient coins, jewelry, vases and statues. 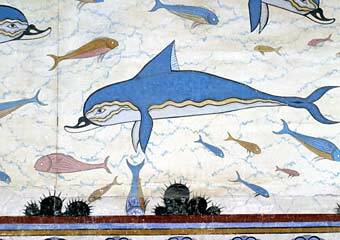 One of the earliest and best-known ornamentations is the dolphin fresco on the wall of the Queen's bathroom in the ancient palace of Knossos on the island of Crete. The Odyssey crew took a day to visit the palace ruins and view the fresco painted over 3,500 years ago by an unknown artist. Poets, scientists, philosophers and artists from seafaring nations around the world referenced this remarkable group of animals for centuries, perhaps none more so than the Greeks who had a particularly strong affinity for dolphins. Their image is seen in frescos, mosaics, jewelry and vases. The animals depicted in the fresco are probably stripe d dolphins. Also seen are a variety of fishes and sea urchins. It is believed that the artist was well conscious that this was an entire ecosystem - the dolphins living together with the fishes and fishermen without negative interactions. It is not surprising that dolphins appear frequently in classical Greek mythology and were closely linked with the gods. The Greek Sun God Apollo described the dolphin as the embodiment of peaceful virtue, undisguised joy and as a guide to another world. He sometimes exchanged his god-like status to assume dolphin form. He founded the Oracle at Delphi (dolphin-town) on the slopes of Mt. Parnassus - a respected prophetess named in the dolphin's honor. Worshipers traveled from all over Greece and beyond to consult her and to ask for Apollo's blessing. According to some myths, Dolphins were once humans and were held in such high regard that killing them was equivalent to killing a person, a crime punishable by death. The Greek poet Opplan wrote - "The hunting of dolphins is immoral and whoever willingly devises destruction for dolphins can no more draw nigh the gods as a welcome sacrificer nor touch their altars with clean hands but pollutes those who share the same roof with him." Today many Greeks do not know there are cetaceans here and much of the ancient reverie for these marine mammals has faded. According to Dr. Frantzis it is difficult to convince most people that dolphins and whales are still found in the Mediterranean. "The only difference between the old days and our [current] period is that now the Mediterranean and also the Greek Seas are heavily exploited by fishing activities, they are over-fished in most of the Mediterranean. This often creates conflicts between fisherman and dolphins who believe that dolphins are the problem creating the depletion in fish stocks - but we all know very well that the fish stock has been depleted by fisherman and human activities. The dolphins were here millions of years ago. All the knowledge [gained by Aristotle] was practically lost [in the years and centuries following his death]. His books were lost until the Renaissance and later when European biologists discovered his notes. So it is not very strange that even today when you speak with Greek people and you tell them that there are whales in Greece, they don't believe it, they think that whales are only in the Antarctic or in the polar areas." Striped dolphins are energetic, and perhaps even playful when bowriding. A group of ten spent almost an hour with us the other day, breaching, tail slapping, rolling and surfing the swell. Therefore, when Dr. Frantzis formed the PCRI and started his work with whales and dolphins some ten years ago, he was effectively the first scientist to study cetaceans in Greek waters since the days of Aristotle. His hope is to return cetaceans to their rightful Greek status as creatures to be preserved and respected. Read more about the Mythology of the Odyssey. The crew encounters striped dolphins while researching in Western Austrlia - click here for more. What did the crew report on one year ago in Sri Lanka? Three years ago in Papua New Guinea? Log written by Genevieve Johnson.